GOING FOR GULLS: Tonight marks the sixth of 12 meetings with the Gulls this season, and the fourth of six scheduled visits to San Diego’s Valley View Casino Center. The Roadrunners are playing the final of a three-game road trip; they’re coming off of a 6-4 loss to the Ontario Reign Saturday night. The Gulls are playing the final of a four-game home stand; they’re coming off of a 2-1 victory over the Chicago Wolves Wednesday night. #91 PRODUCTIONS: Dylan Strome was held without a point for just the sixth time in his 23 games played Saturday night in Ontario. Strome (1.48 P/PG) and San Diego’s Kalle Kossila (1.32 P/PG) are the top two players (with at least 20 games played) in the American Hockey League in points per game. Strome is tied for the lead among all Roadrunners players in scoring against the Gulls this season, amassing seven (3G, 4A) in just three games played against San Diego. SURGING SAN DIEGO: The Gulls enter the evening having won 12 of their previous 15 games and five of their last six. With a 19-13-1-0 record and a .591 win percentage, San Diego is vying to claim first place in the Pacific Division – a spot Tucson currently holds. 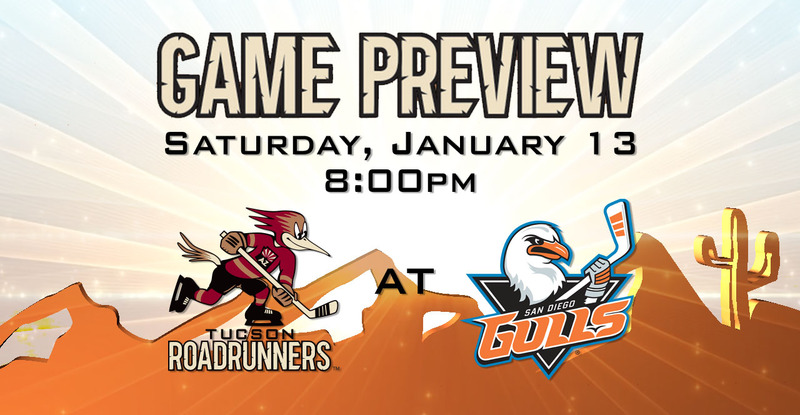 The Gulls have not lost at home since December 27, when the Roadrunners earned a 4-1 victory. PROJECTED LINEUP: The team held an optional morning skate at the Valley View Casino Center ahead of tonight’s game. Per club policy, specifics regarding the team’s lineup will not be published until 6:00 PM this evening. FROM SWEDEN AND SCORING: Mario Kempe registered his second three-point (1G, 2A) game of the season last night in Ontario, and now has eight points (1G, 7A) in his last five contests. Jens Looke enters the evening with a four-game point streak, having accumulated a total of five (1G, 4A) during that span. Looke and Kempe connected for a tally Saturday night in Ontario. 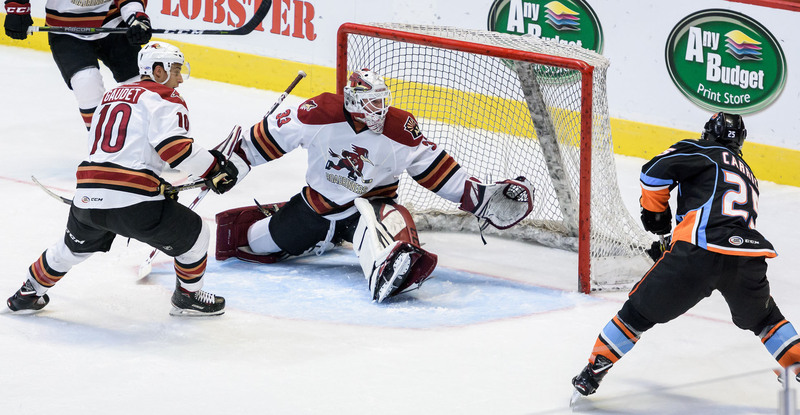 THE LAST TIME AROUND: In the teams’ previous meeting on December 27 at the Valley View Casino Center, the Roadrunners beat the Gulls by a 4-1 score. Four different players scored for the Roadrunners in the win: Nick Merkley, Michael Bunting, Tyler Gaudet, and Mike Sislo. Adin Hill turned away 25 of the 26 shots he faced. BACK-TO-BACK-TO-BACK: Beginning tonight, the Roadrunners will play the Gulls in each of their next three games, all spanning over a five-day period; the meetings will shift to Tucson Arena for contests on Monday evening and Wednesday morning. The teams are currently in first and second place in the Pacific Division, respectively, giving these upcoming three meetings major implications.